SALT LAKE CITY—U.S. News & World Report has released its 2016-2017 Best Hospital Rankings and named University of Utah’s Huntsman Cancer Institute (HCI) one of the top 50 cancer hospitals in the country. 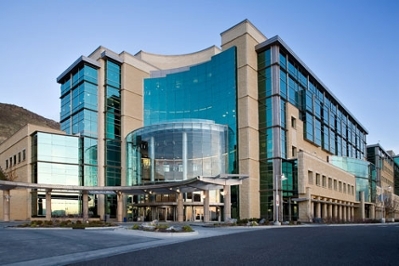 University of Utah Hospital was ranked No. 1 in Utah and in the Salt Lake City metro area. Additionally, University of Utah Health Care (UUHC) was recognized as “high-performing” in geriatrics, ophthalmology, nephrology, neurology and neurosurgery, orthopedics, pulmonology, urology, heart failure, colon cancer surgery, COPD and lung cancer surgery. Approximately 5,000 hospitals in 94 U.S. metro areas were eligible for this year’s rankings. To meet the criteria hospitals must offer each of 16 medical specialties, and then are ranked according to death rates, patient safety rates, procedure volume, and other objective data. The rankings for all hospitals and specialties are available at www.usnews.com/besthospitals. UUHC has 660 hospital beds, more than 1,300 staffed physicians and 11 community clinics across the Wasatch Front. In the last year, University Hospital has admitted 28,000 patients, provided more than 10,000 inpatient surgeries and 15,000 outpatient surgeries, and logged over 40,000 Emergency Department visits. HCI and the University of Utah Health Sciences steward the Utah Population Database — the largest genetic database in the world, with more than 16 million records linked to genealogies, health records, and vital statistics. Using this data, HCI and University researchers have identified several cancer-causing genes, including the genes responsible for melanoma, colon and breast cancer, and paraganglioma. HCI is a member of the National Comprehensive Cancer Network (a 27-member alliance of the world's leading cancer centers) and is a National Cancer Institute-Designated Comprehensive Cancer Center. HCI treats patients with all forms of cancer and operates several high-risk clinics that focus on melanoma and breast, colon, and pancreas cancers. The HCI Cancer Learning Center for patient and public education contains one of the nation's largest collections of cancer-related publications. The institute is named after Jon M. Huntsman, a Utah philanthropist, industrialist, and cancer survivor.